So why did we agree to join forces with Rob and Alex? Well, for starters, they convinced us that they were capable of solving the technical challenges with RotMG that everyone else seemed to think would be insurmountable. Second, they seemed like good, honest, logical guys, which counts for a heck of a lot with us. Third, we appreciated their willingness to buck convention and try new things. RotMG is a game that will never achieve anything close to the active user population of a game like Cityville or Bejewelled Blitz. 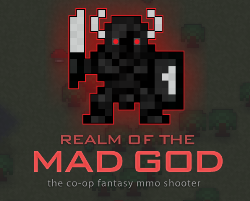 But a game like RotMG doesn’t need to. We can reach many millions of potential players via web game portals like Chrome Web Store. If we can convert just 40k of those people to recurring visitors, we can make a healthy profit. And we can hopefully maintain that community for many years to come, because there’s nothing like RotMG on the market as of now. I would never dream of attempting to launch a game like this on XBLA and PSN or even iOS/Android, with their comparatively much larger audiences. A game like this simply isn’t going to appeal to most people who play it, no matter how well-designed the game may be. And on the Web, that’s entirely OK! See and click the large, pulsing text that says “PLAY”. Immediately begin playing the game as a wizard (the easiest class to wrap your head around) with a randomly-generated name. If you like the game, you can always change your randomly-generated name to a permanent one and experiment with other classes. But we don’t want a single person quitting the game because they weren’t feeling inspired enough to work through an arbitrary account creation process. We know the wizard class is easy to understand and fun to play. We don’t need to make you wade through the tedious process of trying to register a name that hasn’t already been registered by someone else. We want you in the game and playing. Enjoying the game. Congrats to you and your team! Anyway, you have my best wishes for the future! I have an Android phone and would love to play this game on it! I love this game, but earning fame is extremely hard…..
My first thoughts : A game, level cap of 20, you lose everything once you die, and you unlock a few classes as you go…. I won’t play this S#%@ for more than 5 minutes. Thanks for curing my countless hours of boredom!